I was searching through the Silhouette Library looking for a good file to make a card with. When I found the “You are my Sunshine” sentiment I just knew I had to use it. Using the feature in Silhouette Studio that creates an outline of the letters made it so much easier to get the letters straight. All I had to do was adhere them to the outline and then adhere the outlines to the card. This large sentiment is the main focus of the card so just a few embellishments were needed. Sequins (from the $1 store!) You can also get some lovely sequins here. Here’s a close up where you can kind of see the shimmer from the Wink of Stella Glitter Brush Pen. It’s a lot more sparkly in person. This card came together quickly and easily. I can’t want to see what I can make next with my Silhouette Cameo 2! This card was a quick one and it showcases some gorgeous papers by Authentique! The papers I used on this card are all from the Classique: Pretty set. We have them for sale on our e-bay store right now. The set we have usually retails for $30.40 but after the already discounted price along with the extra 25% off we have running right now, it’s just $15.75 which is almost 50% off! 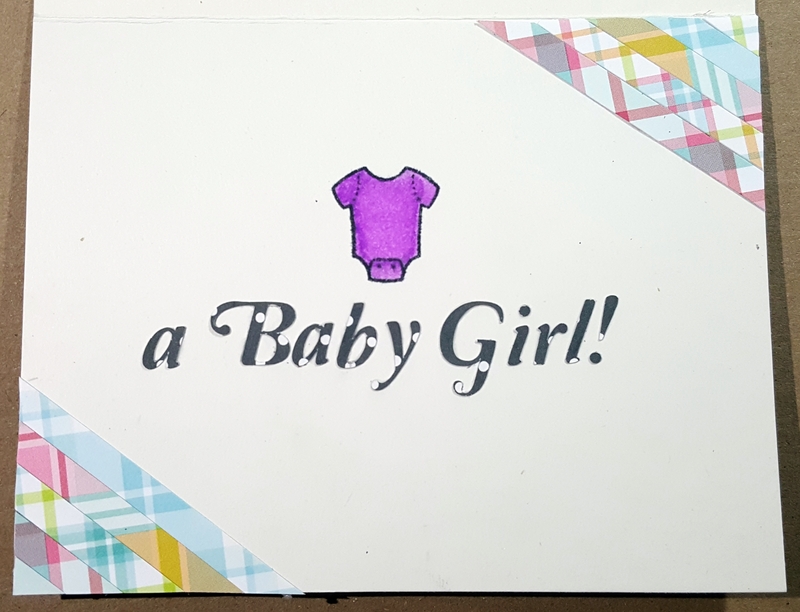 To make the letters on the front that say “We’re Expecting” I used the Amperzand font and cut them out of the Authentique paper using my Silhouette Cameo 2. The inside of the card says “a Baby Girl”. I popped the front of the card up using some adhesive fun foam so when the card gets squished going through the mail you won’t see the outlines of foam tape. Such a cool little trick! This card came together pretty quick and I’m excited for more of my family members to know about our little bundle of joy that’s on the way! Thank you for stopping by. Hi everyone! I hope you had an awesome New Year’s! I recently purchased a Silhouette Cameo 2 as a Christmas present to myself. I’ll be releasing videos using this awesome machine. If you want to purchase this bundle, just click here. If you want to see these videos the second they are posted, make sure to subscribe to the Intoxicating Arts YouTube Channel!